Today I want to show you how to make this cute little dog house treat box. This is the perfect gift for the dog lover in your life. You can either fill the box with doggie treats for their pet or people treats for them! For this project, I'm using the PKSC-20 August 2013 Stamp of the Month set. I love the puppy and house in this set! 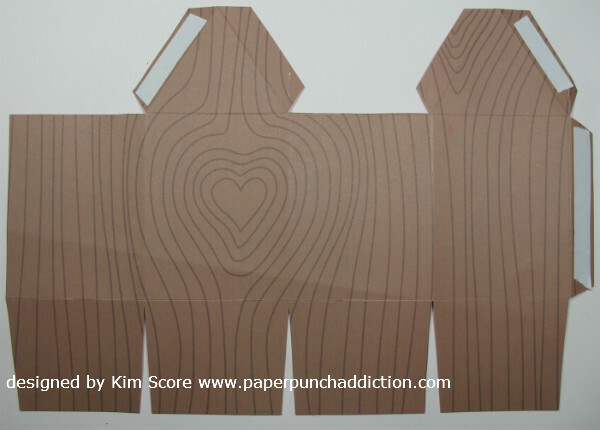 It's perfect for paper piecing for a great three dimensional look. 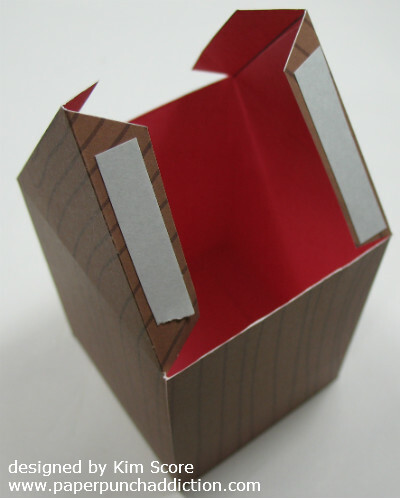 Following are the step by step instructions to make the treat box. Cut a 10-1/2" x 7-1/4" piece of chocolate chip card stock or wood grain designer paper (I used Woodgrain Love by My Little Shoe Box). On the long side, score at 2-1/2", 5", 7-1/2" and 10". On the short side, score at 2" and 5-1/4". Sharpen the score lines. If using a patterned paper, turn the paper over to mark on the back side. On the first and third squares along the top, mark at the center top of each square (1-1/4" is the center of the square). Draw a line from the center point to the lower corner of the square. 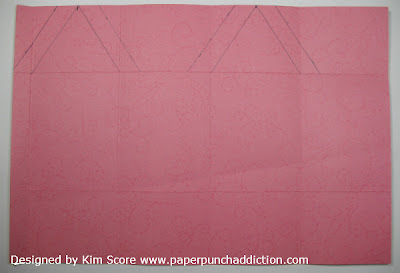 Now measure out 1/2" from the lines just drawn and draw a line as shown. Clip on the score lines and cut away the sections as shown. 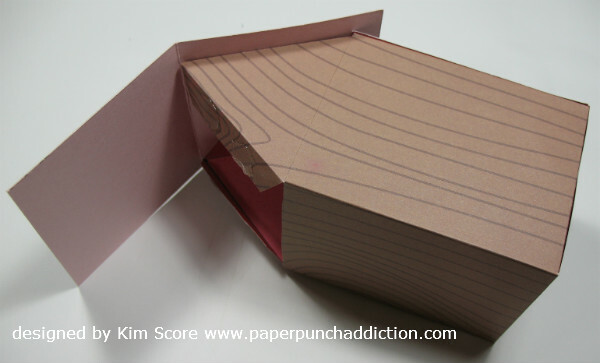 Use a ruler and bone folder to score on the pencil lines. Sharpen score lines. Flip over and put a strong adhesive on the tabs as shown. Do not add adhesive to the inside tabs on the pointed sections. These tabs will be used for the roof top to open and close. Assemble box. Tape bottom flaps of box closed. Cut a 3" x 5-1/2" piece of early espresso or textured card stock. Score at 2-3/4" and sharpen crease. Attach to the two tabs with adhesive. The other side of the roof will be a "flap" to get the treats from the box. Add a repositionable adhesive/velcro/magnets to these tabs so it can be opened easily. Cut a piece of black/espresso card stock 1-3/4" x 2-3/4". Corner round the top edges and glue piece onto the front of dog house. 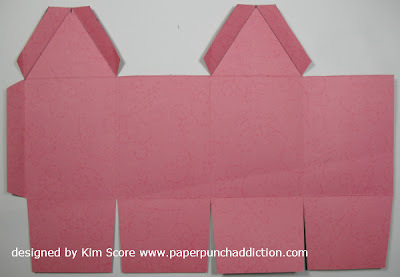 Stamp the puppy twice onto a designer paper or card stock. Stamp the face onto one of the bodies. Cut that head out and mount onto the other dog image with dimensionals. Attach dog to front of dog house with dimensionals. So happy to see you back posting! I hope that all is well with you. 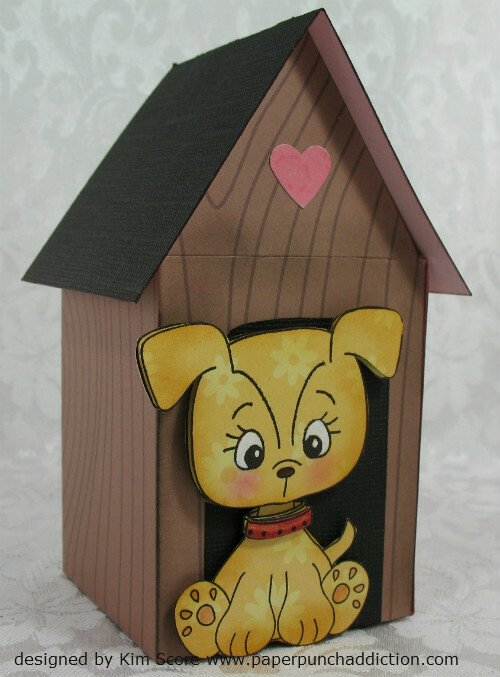 The little dog house is so cute - I can just see this as a birdhouse, etc. also. Thank you for the tutorial! Wishing you a happy weekend! Oh my goodness, this is darling. I can't wait to try one. Thanks for sharing the instructions. Adorable! Thanks for taking the time to share the pattern for this cute treat box! Hugs! That is so cute! Can't wait to try it. Kim thanks so much for coming back on line so we can enjoy your beautiful creations. You are very talented and I want you to know how much you are appreciated. Do you know whether craft central is coming back?